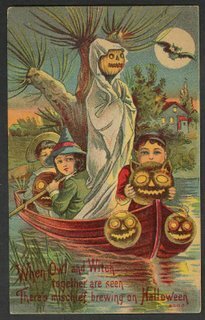 I have a large collection of Halloween postcards from the turn of the century. I like the way they sentimentalized images of fear. I used to collect various Halloween items, but have lost the desire to collect, which is a good thing! Halloween's been a bit over taken by the Hallmark crowd these days, and the inflatables really give me the willies. I have recently put a great number of my animations, including Sesame Street pieces, on youtube. The image quality really goes down the tubes by the time they chew on it at youtube with their video codecs, but I'm happy to circulate them. Maybe if you like them you'll buy my dvd at www.funonmars.com. Shameless Sal.